Contractor’s Lien Advisors, Inc. helps contractors, sub-contractors, and material suppliers to file Mechanic’s Lien. We assist contractors from New York to San Francisco, from Chicago to Key West. Mechanic’s Lien Service you need, prices you want! A Mechanic’s Lien assists construction vendors in collecting payments on unpaid invoices. The unpaid invoices for services or materials rendered on private property jobs where improvements were made are eligible. If a general contractor completes an addition on a house and the owner of the house does not return his phone call or pay the bill, the contractor may be eligible for a Mechanics Lien. On that same job, the company who provided the cement and was not paid can submit a mechanics lien. The contractor who worked on a 1099 for one day to help sand drywall and was not paid can submit a Mechanics Lien. If a contractor was not paid and does not apply for this Lien, the contractor may never receive the money. On any job where the private property owner does not pay vendors for improvements made with materials, services, or equipment, any of those vendors can get a lien. How to File Mechanic's Lien? Filling a Mechanic’s Lien for general contractors and subcontractors have different rules. A Mechanic’s Lien will protect both general contracts and sub-contractors. However, each contractor will have different time lines and different paperwork to submit. Check the laws in the state where the work was performed. Liens need to be filed in the state where the property is. Understanding how to set up jobs in order to be able to collect on a mechanics lien is just as important as effectively activating a lien. If jobs are not set up correctly in the beginning – a contractor is going to have to work harder to collect owed money. Make sure the contract spells out the deliverables and the payment terms and conditions. Check to see if there is any detail owners need to agree to before a job starts to cover all the bases. Illinois Mechanics Lien Act details a hold procedures against a home owner’s property by contractors, subcontractors and suppliers. If the laborers are not paid, it can result in a foreclosure action, forcing the sale of property or even prevent the refinancing until the lien is satisfied. Applying mechanic’s lien laws seems obvious, but case law has dissected and analyzed this to the point that mechanics’ liens are often misunderstood. 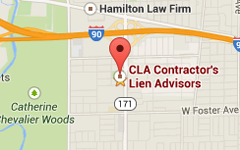 For more information on how to file mechanics lien in Chicago, contact us at Contractor’s Lien Advisors, Inc today.